This spectacular image shows Yepun, the fourth 8.2-metre Unit Telescope of ESO’s Very Large Telescope (VLT) facility, launching a powerful yellow laser beam into the sky. This spectacular space wallpaper shows Yepun, the fourth 8.2-metre Unit Telescope of ESO’s Very Large Telescope (VLT) facility, launching a powerful yellow laser beam into the sky. This Laser Guide Star (LGS) is part of the VLT’s adaptive optics system. The light coming back from the artificial star is used as a reference to control the deformable mirrors and remove the effects of atmospheric distortions, producing astronomical images almost as sharp as if the telescope were in space. Yepun’s laser is not the only thing glowing brightly in the sky. 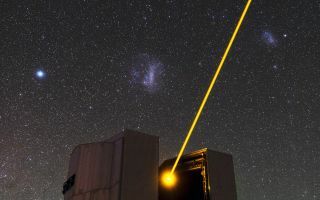 The Large and Small Magellanic Clouds can be seen, to the left and to the right of the laser beam, respectively. These nearby irregular dwarf galaxies are conspicuous objects in the southern hemisphere, and can be easily observed with the unaided eye.